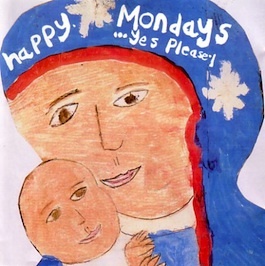 Factory Records: FACT 420 HAPPY MONDAYS Yes Please! * With fold-out lyric sheet. ** Titled after "COWBOY" DAVE ROWBOTHAM, former guitarist with THE DURUTTI COLUMN, slain in August 1991. Notes: There are 16"x24" and 40" x 60" promotional posters for this release. Factory/London also issued a 'Yes Please' Interview CD for promotional purposes, with a catalogue number of 'On 1' (~ ON1 10205311 01 % Made in U.K.by POD), in a plain white cloth sleeve.